A Heartless that studies its enemies before launching bombs at them. It generally targets the weakest of the bunch. It is immune to fire and lightning. The Camo Cannon is an Emblem Heartless exclusive to Kingdom Hearts II Final Mix. Camo Cannons are shaped like a small cannon. Its body is faded green, resembling camouflage print, with yellow highlights and silver rivets. It has four short, sharp, silver legs, a large, silver spike on either of its sides, and a black base. 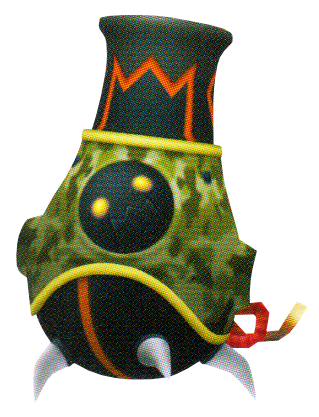 The Heartless's face is a black sphere with glowing yellow eyes set in the front of the cannon's body. The actual barrel of the cannon is black and has several orange designs that cause it to resemble a face, with the mouth of the cannon being the nose. It also sports a short, curled, red fuse in its back. The Camo Cannon's name refers to its camouflage coloration. The former part of its Japanese name could be a reference to suppressors, commonly called "silencers". These are devices that are attached to the barrel of a firearm to reduce the amount of noise and flash generated by firing the weapon. The latter parts of the Heartless's names reference its cannon-like appearance.